According to the weather channel, a good portion of the country is in for a seriously oppressive heat wave this weekend (woof!). While it would be great to make the most of this super sunshine and hit the beach, I'm stuck in the city this weekend figuring out different ways to keep cool. While there are certainly plenty of other ways to beat the mega heat this weekend, a cold and refreshing cocktail certainly makes the list! 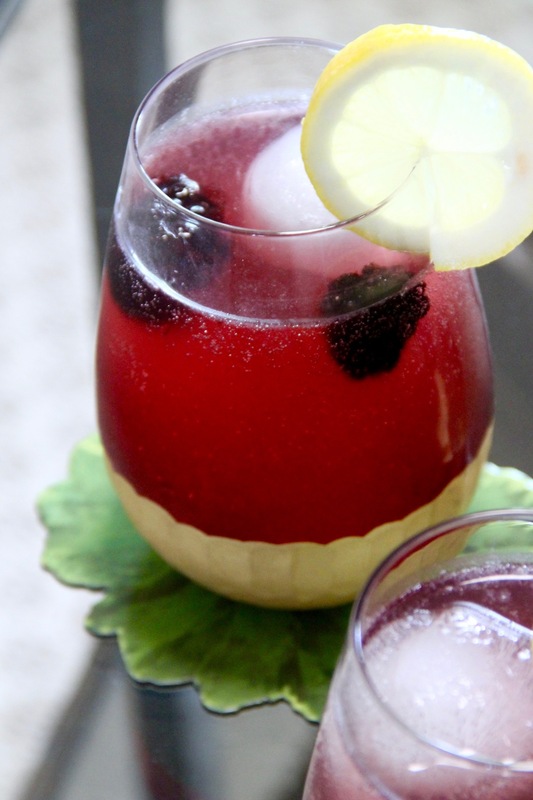 Specifically, my latest go-to cocktail creation - a blackberry and lemon white wine spritzer! Beer is too filling in my opinion and while I am a major red wine enthusiast, this weather is just way too hot for red wine drinking. Instead, this weekend I am opting for a cool and refreshing white wine spritzer with a fabulous new twist! Combining two of my favorite things (Napa Cellars Wine and Spindrift Blackberry Seltzer) with a little hint of lemon and a few frozen blackberries has resulted in a drink that is not too sweet and a most delicious flavor profile. If you are in the market for a new cocktail recipe this weekend, I highly recommend trying this recipe.